More than 20 formal gowns and pieces of apparel of American First Ladies are on display at the Richard Nixon Presidential Library and Museum in a new exhibit, Why They Wore It: The Politics & Pop Culture of First Ladies’ Fashion, which breaks new ground by exploring — for the first time — how each First Lady used her favorite styles to advance her own — and her husband’s — agenda, by embracing special causes and promoting political positions. This colorful, original exhibit is the first setting in which one of First Lady Melania Trump’s dresses is on display outside of the Smithsonian in Washington, D.C. Featured in the exhibition is the silver sparkling bell-sleeved Dolce & Gabbana dress worn by Mrs. Trump at the G7 Summit in 2017. She debuted the dress among world leaders on May 26, 2017 at a concert by La Scala Philharmonic Orchestra at the Ancient Theatre of Taormina in Sicily. The colorful exhibit features actual and exact replica dresses designed to appear as if they are walking down a runway. It opened August 1, 2018 and will be on display through September 12, 2018. The exhibit is curated by Carl Anthony, author of twelve books on first ladies and the nation’s expert on the political and social power of presidential wives and families. First Lady Pat Nixon’s iconic tea-length red wool coat —worn as she accompanied her husband in China on their historic visit in February of 1972 and seen all around the world— is on display for the first time in six years as part of this exhibition. The red coat symbolized good luck and friendship, and proved to be an important diplomatic statement in early Sino-American relations. 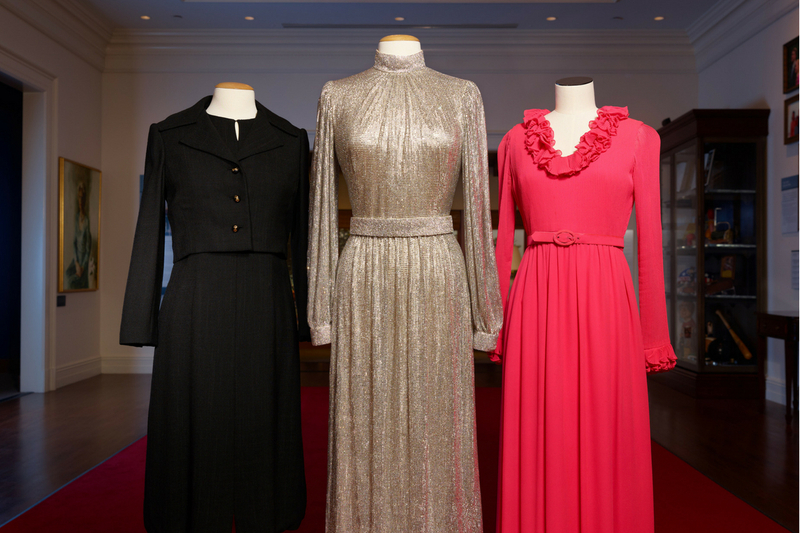 Accompanying these two renowned apparel pieces are seven additional original dresses worn by First Lady Pat Nixon; exact replicas of gowns worn by Mary Todd Lincoln, Lucy Hayes, Frances Cleveland, Grace Coolidge, Eleanor Roosevelt, Mamie Eisenhower, Jacqueline Kennedy, Rosalynn Carter, Nancy Reagan and Barbara Bush; and two original dresses worn by Tricia Nixon Cox and Julie Nixon Eisenhower. 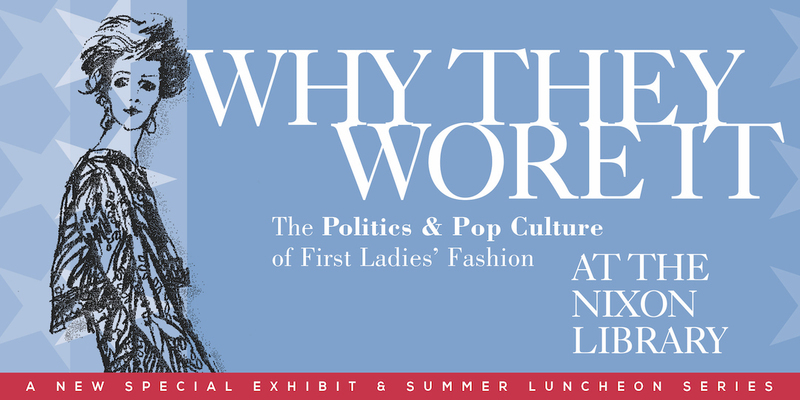 As part of the exhibit’s opening, curator Carl Anthony has launched an all-new, 140-page book, entitled Why They Wore It: The Politics and Pop Culture of First Ladies’ Fashion, featuring more than 100 photographs of every First Lady from Martha Washington to Melania Trump, many never-before-seen. It is his thirteenth book on first ladies. Admission to the special exhibit is included with paid admission to the Nixon Library. It is open daily from 10 AM to 5 PM (Sundays 11 AM to 5 PM). First Lady Melania Trump’s Dolce & Gabbana dress flanked by First Lady Pat Nixon’s black suit and pink dress. PLUS! The hottest social outing this summer! The Nixon Library is hosting an exciting seven-part speaker and luncheon series, featuring six knowledgeable titans of the fashion industry, including those who designed gowns for First Ladies, and those who wrote about, critically reviewed and drew attention to them. Each luncheon menu will include courses that First Ladies served to her White House guests. Each lecture will open with a new, short film that reviews that reviews the styles of the First Ladies under discussion, set to popular music of the time period. A noted journalist and former editor of Us Magazine, British Vogue, Self Magazine & the NY Times Style Section, Mrs. Koegh is the author of Jackie Style, and will discuss the iconic fashion trends of Jacqueline Kennedy and Nancy Reagan. Considered a trendsetter and legend in his own right, Mr. Costa designed elegant ball gowns for Rosalynn Carter and Lady Bird Johnson. He will talk their favorite tastes — and show off some of his new styles on stage. Michael Faircloth has developed a worldwide clientele for custom garment design and has become a leader in the arts and fashion community. Mr. Faircloth will discuss his work with Laura Bush and other members of this presidential family. An award-winning magazine editor and bestselling author who has held top positions at Harper’s Bazaar and Vogue, Mrs. Betts is the author of Michelle Obama and the Power of Style, which she will discuss along with her fashion observations about the current First Lady Melania Trump. Molly Sorkin is a fashion historian who co-curated the exhibitions Oscar de la Renta: American Icon (2013) at the William J. Clinton Presidential Center and Oscar de la Renta: Five Decades of Style (2014) at the George W. Bush Presidential Center. She contributed an essay to the book Oscar de la Renta, which accompanied the exhibition, Oscar de la Renta: The Retrospective (2016) at the de Young Museum, San Francisco. Mr. Anthony will present a lecture focused on First Lady Pat Nixon, who unintentionally had the most overt impact of any First Lady on the nexus of politics and popular culture, and Betty Ford’s role in also shaping Seventies styles. For discounted, special group rates, call Michael Young at (714) 701-6823. *There will be assigned seating. Tickets purchased together will be sat together. If you have friends attending and want to sit with them, please let us know on the ticket order form.